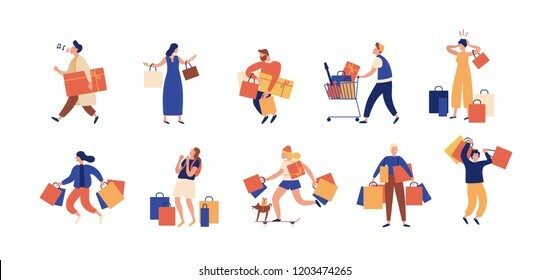 160 place | Vector illustration in rank M-rank: Collection of people carrying shopping bags with purchases. Men and women taking part in seasonal sale at store, shop, mall. Cartoon characters isolated on white background. Flat vector illustration. Collection of people carrying shopping bags with purchases. Men and women taking part in seasonal sale at store, shop, mall. Cartoon characters isolated on white background. Flat vector illustration.